Mormon Mommy Writers and Friends: The Modern Bestseller: Written By Social Media? 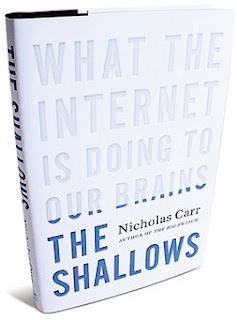 Lately I've been reading a very interesting book by Nicholas Carr called "The Shallows: What the Internet is Doing to Our Brains" (spoiler alert: what it's doing to our brains isn't good). It's a fascinating look at neuroplasticity and technology; specifically, a look at how technology has changed and is changing our brains. The author starts with the invention of things like maps (which increased our ability to think abstractly) and clocks (which made us start mentally quantifying time) and books/publishing (which led to the advent of silent reading- a precursor to individual learning). Now that I'm getting into the part about the internet, I'm finding that he's bringing up some interesting concerns for us writers, like the fact that the 3 best selling novels in Japan in 2007 were all written as strings of text messages, and all written on cell phones. So, what do you think? 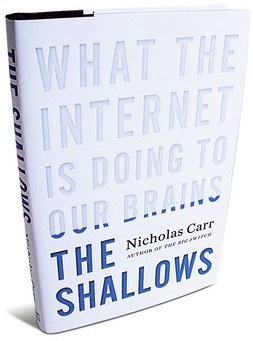 Will digital media and the influence of social media have authors swimming into the shallows? Are we losing an art form here? Is it already happening? Share your thoughts in the comments below! Just kidding. I think that the shift is happening, and it may be inevitable, as our society wanders from reaction to reaction, mostly based on what goes "viral" on the net. Even the news covers what's trending online, usually a day late and a dollar short. It's sad, and I really do hope that there are enough people who will still read for enlightenment and soul-satisfying pleasure instead of social media belonging bunk, that writers can continue to perfect our craft and find nice supple brains to soak up our well-thought out words.